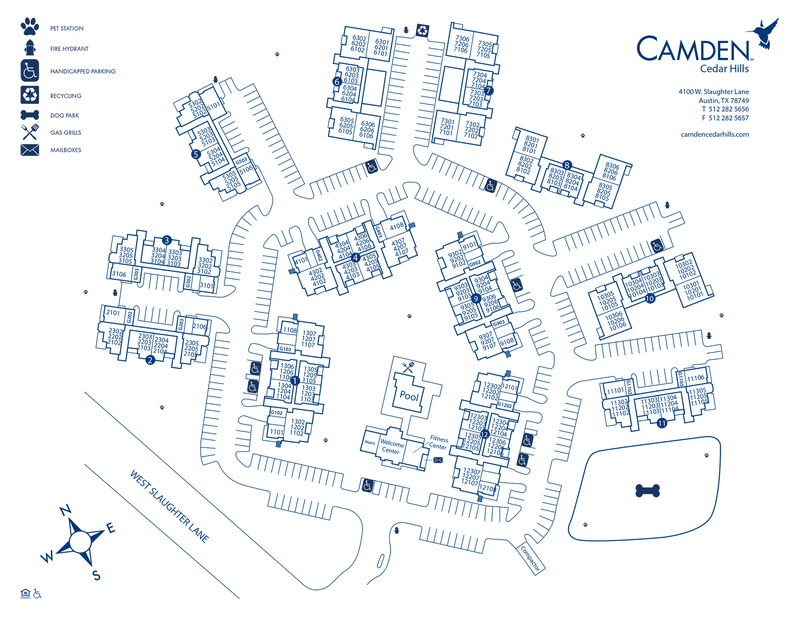 Camden Cedar Hills is a pet-friendly apartment community in Austin offering one and two bedroom apartment homes and townhomes. Enjoy a gourmet kitchen with granite countertops, stainless steel appliances, espresso Shaker cabinets and hardwood-style flooring. The luxurious bathrooms feature white quartz countertops, rainfall shower heads and framed mirrors. Each apartment home also includes full size washers and dryers, pendant lighting and USB outlets. Our two bedroom, two and a half bath townhomes feature an open, split-level floor plan with a formal dining room, breakfast nook and wraparound balconies; each townhome also includes an attached one car garage with additional storage. Host friends and family in the resident lounge complete with shuffleboard, poker and pool tables as well as a spacious kitchen. Enjoy working out in the fitness center or relax by the resort-style pool with outdoor dining area. Your furry friends will love it here too! Let them play in the onsite dog park and walk the beautiful trails of Circle C Ranch Metropolitan Park. We also have electric car charging stations and detached garages available for residents. Residents receive a technology package included in the total monthly rent with a savings of up to 52% off retail. This money-saving package includes high-speed internet up to 300 Mbps x 20 Mbps, WiFi included and 200+ channels including HD channels and HBO. Looking for more options? Access Spectrum and HBO Go from your smart device + over 250,000 Spectrum WiFi hotspots nationwide. At Camden Cedar Hills, you will have an easy commute anywhere in Austin. Our apartment homes are located just off Mopac Expressway, five miles from I-35 and only 15 miles from Downtown Austin. Living here means spending less time commuting and more time enjoying all that our community has to offer. Camden Cedar Hills is the place to be in Austin! At Camden, your pets are family too! We welcome cats and dogs, up to two pets per apartment home with no weight limit. Get the perfect spot! We have ample parking for our residents in our parking garage on a first-come, first-served basis. Attached garages are included with every townhome and detached garages are available to rent for $100 per month.